There are three selections whose odds have dropped in betting markets for this week's Superstar Shakeup. 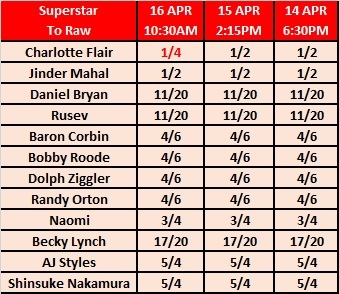 On Saturday, the Kambi oddsmakers put up a couple of markets where customers could place wagers on wrestlers from Smackdown moving over to Raw and vice versa. I've checked in a few times since they were published, but it was only upon this morning's visit where I've noticed adjustments. Charlotte Flair's price to be flipped back to Raw - after moving to Smackdown in last year's Shakeup - has been cut from 1/2 into 1/4. Flair moving over to Raw would be a way to prepare her to tangle with Ronda Rousey at WrestleMania 35 - a match that is reportedly in the plans for April 2019. In the comments section of the most recent Superstar Shakeup post, a commenter mentioned that, to get to Flair versus Rousey, a Royal Rumble win for the former could easily set it up. It could. However, I don't think WWE would want Rousey challenging for Smackdown's title so Flair moving back to Raw would make the most sense. Whether it's tonight is another thing entirely. On the subject of Flair - her WrestleMania 34 opponent, Asuka, has been backed to move over to Smackdown. The Empress of Tomorrow has dropped from 4/6 into 1/3 and is now the favourite in Kambi's market. 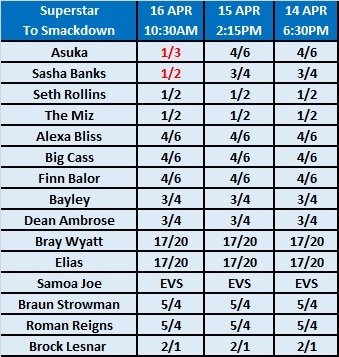 Jumping ahead of Seth Rollins and The Miz. Another name who has been cut is Sasha Banks. She has fallen to 1/2 from 3/4 putting her in joint-second along with the aforementioned Rollins and Miz. I have placed a bet on Banks moving over to the blue brand. I think there's a good chance she or Bayley will head to Smackdown. It would explain why WWE is giving away a singles match between them on tonight's show. Other bets I've placed. These aren't tips, just small wagers I've placed for this week's show. Becky Lynch to Raw - I think she has done everything at Smackdown and would make for a change to see her on a different show. Finn Balor to Smackdown - No real reason other than the new environment idea. Randy Orton to Raw - I am not as strong on this one, but think he needs a change of environment as well. It would also add intrigue to his upcoming match against US Champion, Jinder Mahal, with the title potentially moving to a different brand. With that said, Mahal could be on Raw and it'll be Orton's job to try and retrieve the title for Smackdown. This is why the pick isn't as strong. Samoa Joe to Smackdown - This was an idea given to me last night. What if Reigns is Universal Champion for Backlash and the story is Joe could take the strap to Smackdown? It's the same sort of idea for the US Championship with Orton and Mahal and would explain why the company has announced matches for the PPV as soon as the Monday and Tuesday following Mania. We'll see how well they fare over the next couple of nights.